Rockdoor Stable Doors are part of the Ultimate range from Rockdoor; the Rolls Royce range of Composite Doors. These external doors have an energy rating of A (if fitted with clear backing glass) and have a security rating of 1 as standard. With three distinctive styles to choose from, plus the range of glazing options to pick between; there is bound to be an external Stable Door perfect for you and your home. These are the strongest external Composite Stable Doors on the market, with carbon fibre reinforced frames, high impact door skins and a 6 pin ‘Secured by Design’ lock cylinder. The external Rockdoor Stable Door has warm edge spacer bars along with argon gas filled double glazed units, making this one of, if not the best, Stable Doors for thermal efficiency. This range Composite Stable Doors are available in 14 different colours including Oak, White and Chartwell Green. 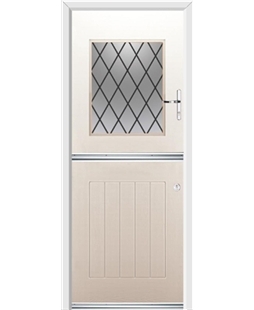 This Composite Stable Door design from Rockdoor is perfect for homes which need to make the most of natural light. This design has several lead glazing designs to pick from, along with a plethora of privacy glazing pattern options. 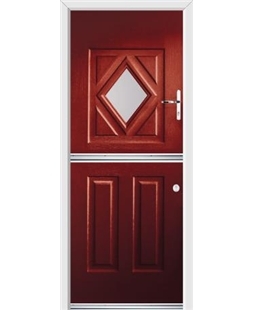 These Composite Stable Doors are available in 8 vibrant colours and 4 realistic wood effect skins. The large glazed panel allows sunlight to stream through, without impacting on thermal efficiency levels. The Stable Spy Stable Composite Door from Rockdoor has a smaller glazed aperture than its sister door, the Stable View. This is a door that displays the realistic wood effect skin impressively well because of it, with the eye being naturally drawn to the intricate wood grain pattern. These Composite Stable Doors are the best energy and security rated Stable Doors available in the UK. 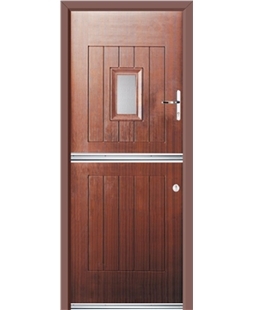 This Stable Door is available in a dozen colours, meaning you are bound to find one suitable for your home. The Stable Diamond Composite Stable Doors are our most contemporary option. Its striking mouldings and diamond aperture will make your entrance point stand out, regardless of whether it is utilised as a front door or back door. This Composite Stable Door is rated A for energy efficiency and 1 for security; it is fitted with a 'Secured by Design' cylinder and secure multi-point locking system.